Dimension/Size: thickness - 2MM to 6MM. Width - 4 foot. Lenght any. 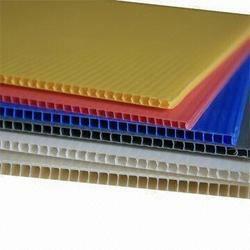 Propack Manufacture and supply COnductive PP Corrugated sheet. We are the Leading Manufactuers of Sunpack Sheet. Available Color: Red, Yellow, Blue, Green etc. 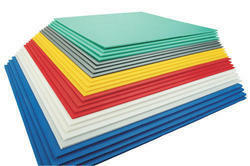 We have gained an edge over other firms by offering the best quality of PP Flute Board to clients. These boards are manufactured using the best quality raw materials at our state-of-the-art infrastructure facility. These are available to clients at leading market prices. These boards are sturdy, durable and damage-resistant. In order to meet different requirements of our valued clients, we are offering an extensive array of PP Fluted Sheet at market leading rates. Our sheet is broadly demanded for its longer service life, weather resistance, sturdy and robust structure.